Welcome to the Couch Club, our weekly column devoted to all things #DCTV! This week, Lissete Gonzalez looks at Arrow baddie Ricardo "Dragon" Diaz, and why when it comes to powers, sometimes less is more. As great as they are, superpowers can be overrated at times, especially when it comes to villains. Don't get me wrong, all villains, whether they have powers or not, are still terrifying and evil in their own way. But there’s just something incredibly interesting about a villain who managed to make their way up through the ranks without a single ounce of superhuman ability aiding their endeavors. 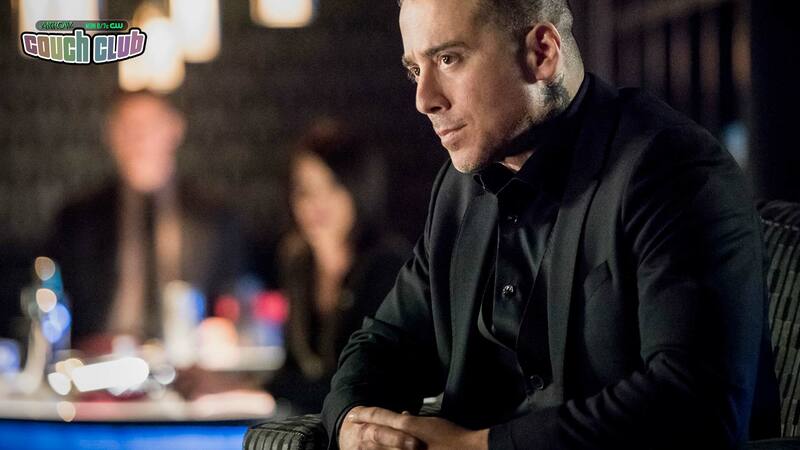 Arrow’s Ricardo “The Dragon” Diaz (Kirk Acevedo) is the epitome of this kind of villain. We first met him last season, and since then we’ve seen him take complete control of Star City while thwarting every single effort Team Arrow has made to stop him. Diaz doesn’t need powers to be an intimidating, feared and completely ruthless villain. And where other villains have failed to inflict impactful damage on the team, Diaz has done it with pure ease. But what makes non-powered villains like Diaz so effective? Well, for starters, as cruel as they can be, they’re still very relatable. They’re 100% human, and we can empathize with them. We understand their pain, their loss and their need to find a greater purpose. Even with their skewed morality and distorted perception of what’s right and wrong, we truly feel for them. Every villain has their origin story, and most of the time they come from a place of pain and trauma that came about from horrific, life-altering incidents they’ve experienced. Maybe we all haven’t experienced pain like that, but we can still put ourselves in their shoes and understand them, even if they’re as crazy as Diaz. Last season, Diaz had an entire episode dedicated to his story. We were taken back to his childhood and learned he was an orphaned child that was constantly harassed and bullied, suffering both extreme forms of physical and emotional trauma. He had to endure these struggles growing up and needed to become someone else in order to survive. As far as coping with his fear, he had to internalize it, give it a name (The Dragon) and put himself in control of it. His motivation to keep moving forward was to take back control of his life after he spent so much time being manipulated and bullied. Instead of seeking a path of rehabilitation, he instead sought vengeance against the world and set his eyes on controlling everything else around him. When a viewer can empathize with a villain, they’re seeing the humanity in them, even if there’s very little left. At the end of the day, he’s nothing but a normal human being, just like you and me, and that’s part of what makes villains like him so interesting. While villains with superpowers may have similar characteristics, the ones that don't have them are arguably more interesting since they use their ordinary human abilities to cause the same chaos and damage as those that do, often with even greater results. Instead of relying on powers, Diaz managed to fight his way to the top of a crime syndicate by leveraging his pain and trauma into a need to prove himself greater than those who had abused him. It’s the sort of motivation that few understand. Ironically, one person who might understand it is Oliver Queen. His rebirth as Green Arrow was born out of pain as well. Only, he came to see that pain as a sort of penance for the frivolous life he lived prior to then, and his survival as a gift of fate. In response, he devoted his life to becoming something more than he was—someone who would fight for those he once stepped on and take down the corruption his family and their circle of questionable colleagues once contributed to. The idea that someone would face a similar trial and emerge a monster likely wouldn’t occur to Ollie until he was faced with it. Perhaps that’s why Diaz has been his most devastating and effective enemy since the show debuted. Diaz didn’t need powers to become one of the biggest threats Team Arrow has ever faced. But as we saw recently, it looks like Dragon might be stronger than ever now. If he came this far without having abilities, how much more of a threat will he be once he has them? And considering how Oliver's spent this season so far, will Green Arrow even stand a chance against him? Arrow airs Mondays at 8 p.m. (7 p.m. CST) on The CW.